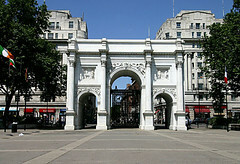 An area of West London, centred around the Marble Arch itself, in W1. It is really at the intersection of Bayswater to the north-west, Marylebone to the north-east, Mayfair to the south-east, and [Hyde Park]? to the south-west. Speaker's Corner of Hyde Park is located nearby Marble Arch Station. Last edited 2009-01-12 11:32:27 (version 5; diff). List all versions. Page last edited 2009-01-12 11:32:27 (version 5).